Upon seeing that I had put a borrowed dog in my engagement photos and in my wedding, a friend of mine said something a little too snarky and disapproving about how the dog wasn’t even mine. Because I’m a good Midwesterner, I did not say what I wanted to say, which was, “Bite me” and instead pretended I didn’t hear. 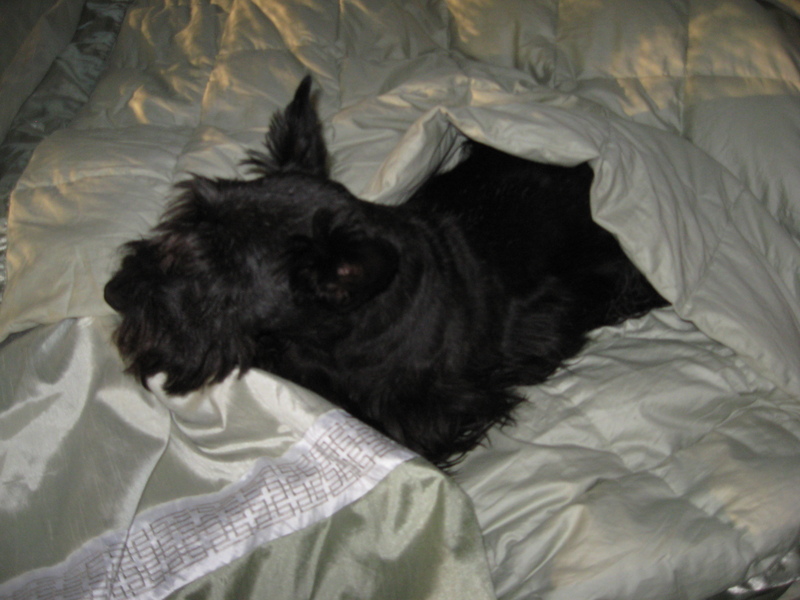 In the legal sense of the word, the dog was not mine so long as his owners—family friends for whom I had been petsitting for for two decades—were alive, though I’d asked them to sign a document addressed To Whom It May Concern stating that should they both be eaten by lions while on safari, their most recent Scottish Terrier would belong to me. I couldn’t stand the thought of this bright-eyed creature being sent off with someone who knew him or loved him less well than I did, like some poor protagonist from a gothic novel. One of the repeated struggles of my life—and maybe you are the same—is that the labels that we put on relationships never seem to accurately or completely encompass how we experience those relationships. The labels make the person or quality of love seem mundane, like any old parent, husband, pet when we know them to be something larger than that, more unique, special. I move easily between speaking of growing up as an only child but also of my two brothers (half brothers who arrived a state away when I was nearly an adult but to whom I hate referring as “half brothers” because it makes them sound somehow less significant). I have cousins who, in my mind, are siblings or best friends. My mother has always been more than just a mother because she and I kind of grew up together and can talk for hours about whatever we’ve just read, seen, or thought, and I can’t quite categorize that…are we more like siblings? Friends? Or just run-of-the-mill parent-child and I’m delusional? I’ve had friends who in some ways felt like spouses. And I’ve got a spouse who has so transcended my idea of what “spouse” means that there should be some other word that denotes him…a word that shoots sparks and sings. Mac, never on the right side of a door. 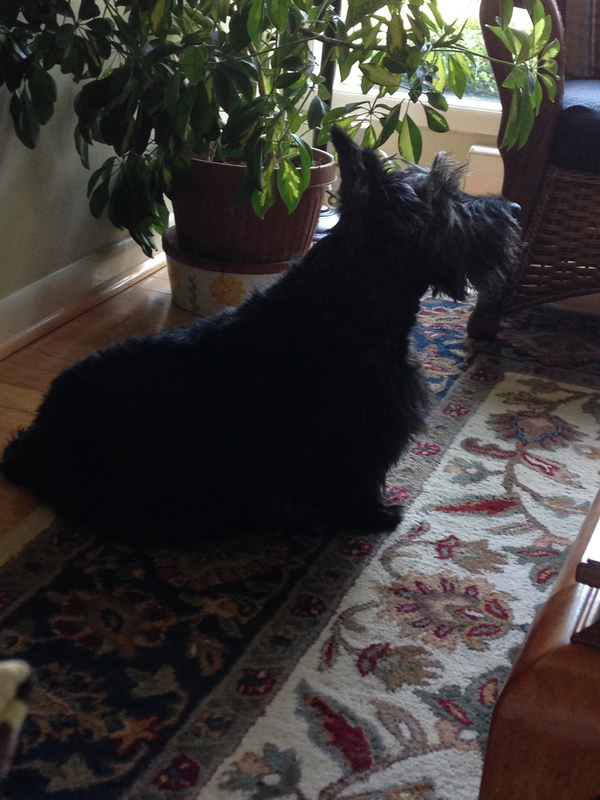 And then there is the above-mentioned Scottish Terrier: Mac Harvey, Macadoodledoo, Macaloo, Mackie. My fairy god dog. His humans–people who over the years themselves became indefinable, something closer than friends, a different kind of family–adopted him as a puppy only after I promised to babysit him while they were overseas for several weeks. 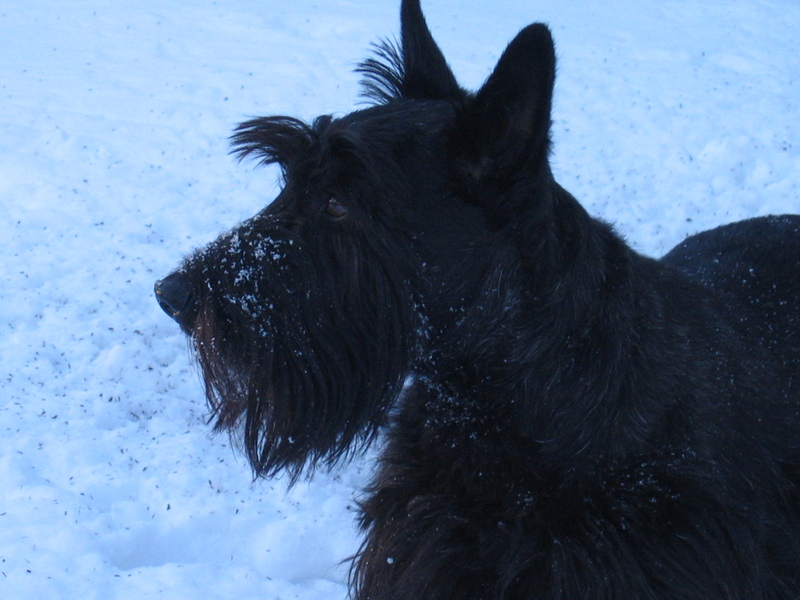 They invited me over to meet him the day he came home, and like most Scottish Terrier puppies, he was 90% ears and 10% dog. Puppies are not hard to fall in love with, and he was no exception, though within weeks, it was impossible not to believe he was exceptional. He was something more amazing than someone else’s pet that I had to let in and out the door 37 times a day. I’d cared about his owners’ other pets—I’d wept when they died—but when Mac came into my life, I became 100% a dog person, 100% his. He’d get bored and string toilet paper and chewed magazines pieces throughout the house, and I couldn’t get mad. He’d hog the bed. He refused to come in at night after his curfew and I’d worry about the coyotes I was sure were out there waiting to bite into him. He once ate some of the papers I was grading so I had to go to class and confess, “My dog ate your homework.” But he never once felt like an obligation or a job. He was always a delight, even when he made a poor decision like Beth’s new bra = chew toy. He arrived at a crossroads in my life thirteen years ago. My father had recently died. I’d returned from a transformative summer in Ireland. A few months before his arrival, the nature of the world had gotten scarier and more paranoid because of September 11th. I was a year deep into therapy that had me naming what I wanted out of life for the first time—to say without apology that I wanted a partner and maybe a baby and a writing career. And also, I’d just met a Zimbabwean co-worker who I was sure was meant for me though he didn’t know it yet. I’d toss Mac into my new car—the first car I’d paid for myself—and we’d drive around town, his snout poking out the crack of a window, and he felt like mine and it felt like the life I’d been meant to have, a woman and her dog, looking for an adventure. 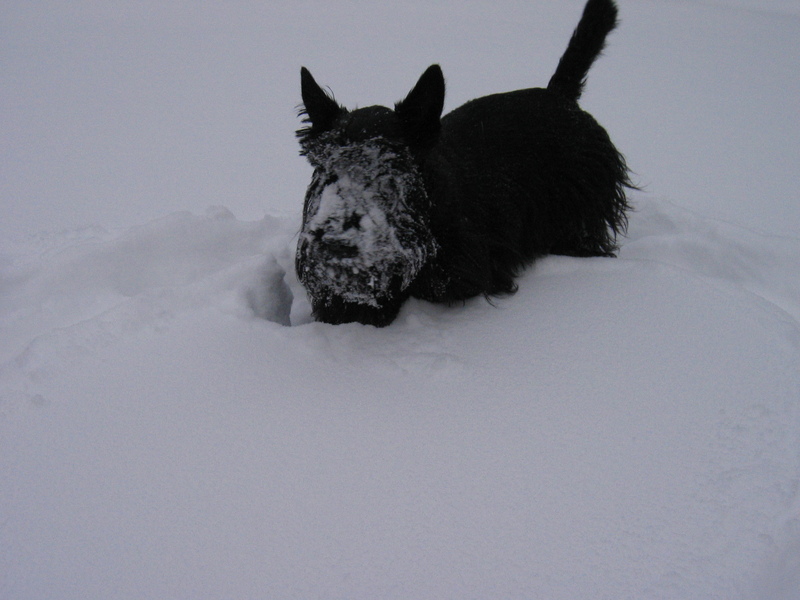 Mac with a side order of snow. 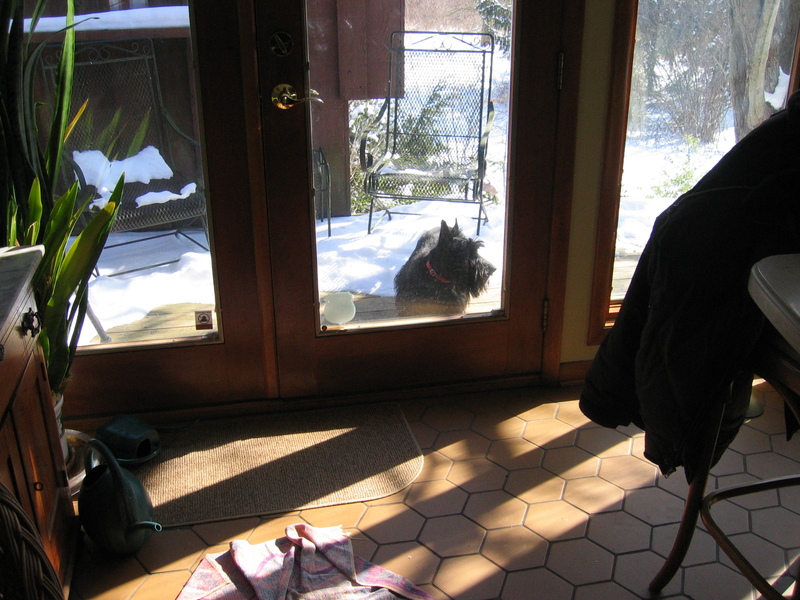 My first weekend with Mac, I called my paternal grandfather to see if I could bring the puppy over to meet him. Grandpa loved Julia Roberts movies and dogs unequivocally, and I couldn’t wait to introduce him to Mac, who was still so small that he sometimes tipped over when he hiked his leg. But when the phone was picked up at Grandpa’s house, it was my aunt’s shaky voice instead of Grandpa’s, and she said tearfully, “Oh, Beth! Grandpa died this morning.” That weekend Mac and I hosted my cousins at what was one of many family gatherings at his generous humans’ house for a modified wake. He distracted us from our grief and won our hearts when he took, very gently, tiny bites of a muffin offered to him by one of the toddlers, as if he knew that she was a more delicate creature than the rest of us and her soft flesh could be pierced by his sharp puppy teeth. (He was also very tolerant when later she shut herself into his kennel.) From this first introduction and subsequent family gatherings, more people fell in love with him. One cousin deemed him “cool”, another made him a Christmas present, friends came to stay with me in no small part because they’d get to spend time with him, and those among them who weren’t dog lovers would leave saying, “I’d have a dog if I could have one like Mac.” Even while Z and I were in Ireland two months ago, my cousins there who’d come to stay at “the dog house” for a week twelve years ago, asked after him and showed me photos of their young son playing with him on the floor. Eoin and Mac were great pals that week. Now Eoin is in college. Because Mac’s people traveled a lot, I stayed with him multiple times a year. He slept in the middle of the king sized bed I slept in, nudged me awake at ungodly hours to go outside and police his yard, he’d jab at the back of my legs with his strong snout to hurry me along in his supper preparations. We walked on “his” campus at Earlham, where he was well known and strutted around, a sort of stately gentleman about town (when he wasn’t terrorizing squirrels). Though all the experts talk about how headstrong terriers are and how they should never be let off a leash, Mac was sensible, had been well-trained, and almost always came when called unless a particularly delectable rabbit was in the underbrush. His parents gave him freedom and full run of the campus, and so I let him off leash as soon as we were a safe distance from the road, and he would race around the paths and grass like a mad man. He delighted the students who were homesick for their own pets, treed every squirrel who dared step on his grass, scampered in the woods behind the main campus, and would attempt to sneak into the building where his dad taught. He and his three good dog friends—Lilly, Phoebe, and Luther—would occasionally meet there for a ramble, and he’d be so excited at the prospect of being with his little pack that he’d start howling before I’d parked the car and let him out to to tear off with them, happy to be with his own kind. A few years ago, my cousin came down to visit with her new, very teeny and adorable dachshund, and while we walked the campus, everyone oohed and aahed over little Zoe instead of the now greying Mac, who stood patiently while she was in the spotlight, reminding me of how I used to feel as an only child when other children were in my domain. Mac was tolerant of and polite to Zoe all weekend, but when he saw her and her mother drive away on Sunday afternoon, his tail wagged extra hard and he did two victory laps around the driveway, his only-dog status restored. Favorite spot in the bed. I’ve written here about his antics, his refined tastes for bottled water, how he’d put himself firmly between me and Z or between me and whatever new baby someone had dragged into his house to establish his ownership of me. He was clever and would play hide and seek with a bone: I would hide it, he would find it, he would hide it—walk me around the house, barking encouragement—until I found it. We’d do this for what felt like hours and he rarely tired of it. He often spent holidays with my family, so there he is in our Christmas photos and Easter photos, on the fringes of baby showers, wakes, reunions. My friends with children had to regularly grit their teeth when they would tell me a story about their kids and I’d respond with a story about Mac, as if the child and the dog were equal entities. But he did feel like my baby. I was always looking for the toy that would please him and enhance his intellectual development, talking to him as if he were an adult human. I felt his shame the day he had a bout of gastrointestinal distress while on his campus walk and had to be brought home sitting in the backseat in a garbage bag, with just his head poking out, and then had to suffer the further indignity of having his backside scrubbed. I had to take him to the vet more than once because he wasn’t acting like himself, and I felt the anxiety that “real” pet owners and, I’m guessing, parents of human children, must feel whenever their own ones are sick and cannot say, “This is what hurts, you fools, FIX IT!” As he got older, I worried about his aches and his pains, how many more visits I’d have with him. In the five and a half years since I got married and moved across country away from Mac, I flew home multiple times specifically to stay with him because I didn’t want him in a kennel. Fortunately, Mom was often able to stay with him once I left town, so he did not often have many sleepovers with strangers. While in Seattle, if I met dogs on the street and stopped to scratch ears, I’d say to their owners without feeling like a liar, “I have a dog back home in Indiana that I miss so much.” Z and I added a leg to a trip to California specifically to visit him and his parents, who were wintering in Palm Springs, and we were rewarded with a lengthy “talk” from him that seemed to indicate his delight at seeing his extended human pack in a place he’d never encountered them before. On that visit, he proudly walked us from room to room, giving us a tour of his part-time home. 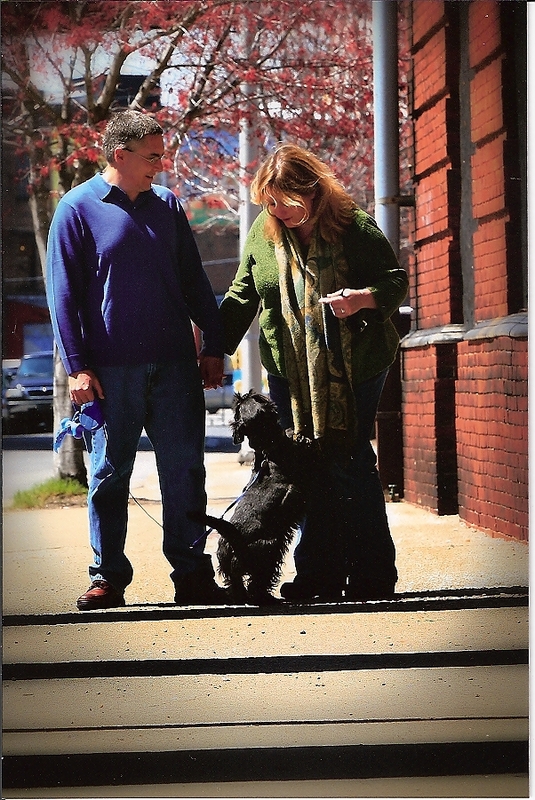 This is Mac with me and Z on our engagement photo shoot at the old train depot in my hometown. Does he look like he is not my dog? Does he look like he’d rather be anywhere else in the world? Is it crazy that I invited a dog that was not mine to share one of the most important days of my life a few months later? Oh never mind. These questions are rhetorical. I really don’t care what anyone thinks—it’s what I wanted and I have no regrets. Maybe it was a selfish thing to have asked his parents to bring him, to insist he be in my wedding without knowing if he wanted to do it. 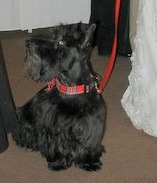 He seemed to like the attention that his red plaid bow-tie commanded and the treats that awaited him at the end of the aisle, but possibly it was overwhelming with too many people in too foreign a place. Yet he felt like part of my family and I couldn’t imagine the day without him. Mac and I happened to be together five months after I got married when I was awaiting the news of whether a crappy diagnosis I’d just received was going to be survivable or would cut short my newly-wedded dreams, and he seemed to instinctively know that I needed him curled up beside me, and after awhile, when he felt I’d wallowed in sadness and anxiety long enough, he’d nudge me towards the door, we’d go for a walk, and I’d be reminded that none of us knows the measure of our days and so we have to enjoy each one as best we can. If dogs teach us anything, surely this is the lesson, over and over and over again. Louis CK says that when you bring a puppy home to your family, it’s really just a countdown to sadness. Which is kind of what this blog has been. 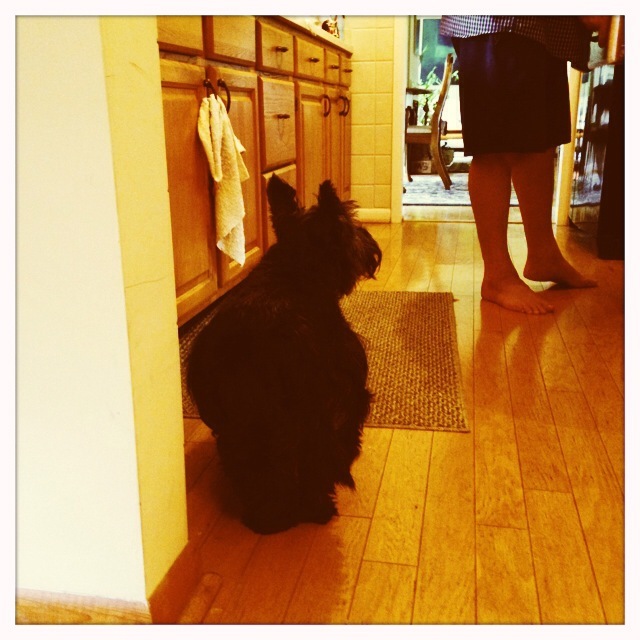 Mac turned thirteen in January, and lived twice as long as any of his owners’ previous Scotties. Because he had a brindle coat, people had been accusing him of being an old dog when he was still young, but he had gotten greyer, deafer, and finally, sick. My mother got to visit with him one last time yesterday, and I am both sad and relieved that I was in Seattle and so didn’t have to say goodbye this morning before he was sent—as Pa Ingall’s tells Laura in By the Shores of Silver Lake about Jack, their brindle bulldog—to the happy hunting ground. In other things I cannot properly name besides those relationships that mean the most to me, I’ve never been a willing namer or acceptor of death. Maybe it is my Christian upbringing. Maybe it is simply denial. But in my mind, my father is still playing golf somewhere in Dayton, Ohio, and has just refused to get a cell phone thus rendering himself temporarily unreachable. All four of my grandparents and an amazing step-grandmother who lived to be 99 can’t figure out the computer to send emails. Eventually, we’ll be in each other’s company again, I think to myself, as I go about my day after a memory of one of them flashes into my consciousness. This separation is only temporary. It’s unfathomable to me that I won’t see my dearly departed again, so I refuse to attempt to fathom it. On days like today I’m not sure if belief in an afterlife is a matter of faith or stubborn refusal to face facts, but I’m glad for the faith or the stubborness that dwells in me and makes some future meeting a possibility. As far as I am concerned, Mac is chasing squirrels, awaiting his next treat, anxious to play hide-and-seek, ready to fight me for the dead center of the bed, and letting out a howl of glee when he sees Lilly, Phoebe, and Luther. Maybe I can allow for this scenario because I am not the one looking at his empty dog dish or his toy hedgehog, never to be retrieved from his basket again. Maybe this is the true signifier that he was not mine. My grief is large, but for his parents, it is larger. Thirteen years ago when his parents asked if I’d be willing to watch the puppy they were considering, would I have answered any differently even if I’d known then how the absence of a little dog with a big bark could wreck me? Of course not. How lucky was I that they let him consistently be in my life and seemed tolerant of what they must have always known: that in my heart, he belonged to me.